You have to love stories like this one. Especially ones involving an ultra-intelligent evil person with an agenda. 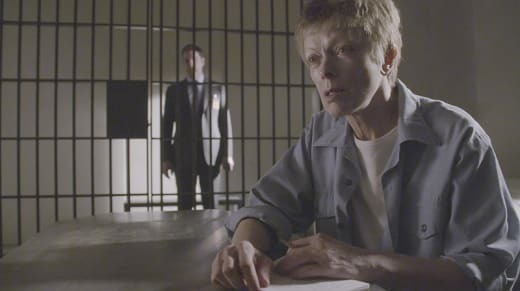 Criminal Minds Season 11 Episode 21 gave us a story involving two abducted young boys, who the BAU managed to rescue, after being lead around by the nose by a nefarious prison inmate. 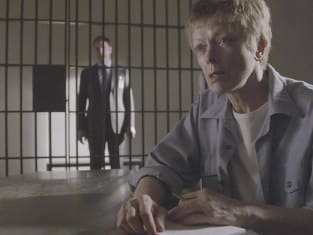 Frances Fisher hit this one out of the ball park with her portrayal of Antonia Slade, a self-loathing diabetic prisoner who made herself appear as someone who wanted to transfer to a prison closer to her home. But we know that was never the goal, don't we? Did it bug you to see the agents all giving personal information to this monster, in exchange for crumbs of information about the case? It did me. This wasn't a person to trifle with, or even humor in any way. Nothing Antonia does lacks substance; there's a purpose for everything she does and says. She's got a plan for Hotch, something we're not going to know about until the season finale of Criminal Minds. In the meantime, all we can do is piece together what we've learned about her. For starters, despite her self-loathing, she appeared to have a huge ego. You had to appreciate Rossi's plan to attack that sense of self-importance by disobeying Antonia's rule about only sending in one agent to talk with her at time. And then when she refused to talk with him and Lewis, they ran that little play in the corridor, making it look like they believed Antonia's boyfriend was the mastermind behind her crimes. The only problem with that scenario is that she probably knew exactly what they were doing, and why, and played along as if she felt threatened somehow....when she clearly wasn't. She wanted them to find ways to pull information from her. That was the only way she could get them to go along with her plan. Try for the life of me, I can't figure out what the bigger picture is; what she's really after. It all seemed to flow so logically, step by step as events occurred. Each action made sense, and there didn't appear to be any holes through which Antonia could achieve anything else, other than the rescue of those boys. Yet clearly, there is something else she's working on. And we come full circle back to those little conversations she had with each of the BAU team members. We know she's a former therapist and is excellent at reading people. In fact, if not for her being a criminal, she might have made a good addition to the BAU itself. So it's fair bet that she used her ability to profile – along with the nuggets of personal information they gave her – to enable her plan, whatever it is. She pegged Reid as a man in mourning for a friend who was his protector; JJ as a competent woman who should be running the BAU but isn't, because people see her as an attractive woman (and presumably nothing more); and for some reason she despises Hotch and Rossi. We got what we wanted from her. Permalink: We got what we wanted from her. Yes, and she got what she wanted from them, too. What Is she doing? What's her plan? Guess we'll find out in two weeks, when we see Criminal Minds Season 11 Episode 22, entitled (appropriately enough, given her warning to Hotch) The Storm. For the first in a long time, the case of the week on this show was much more interesting than any of the team back stories might have been. Does Reid see Morgan as his protector (as Antonia said)? I know Derek was naturally protective of all the team but it's hard to say whether Reid had that particular dependency on him. The song that played after Antonia told Barlow to kill himself was a cover of "Creep", played by Scala and the Kolacny Brothers, on the album "Dawn." The original version was by Radiohead. Note that there's a Belgian choir singing this haunting song. If you need to catch up on any missed episodes, remember that you can always watch Criminal Minds online. What are your thoughts on this story? Do you have any idea how Antonia plans to bring Hotch down? Hit us up in the comments below!